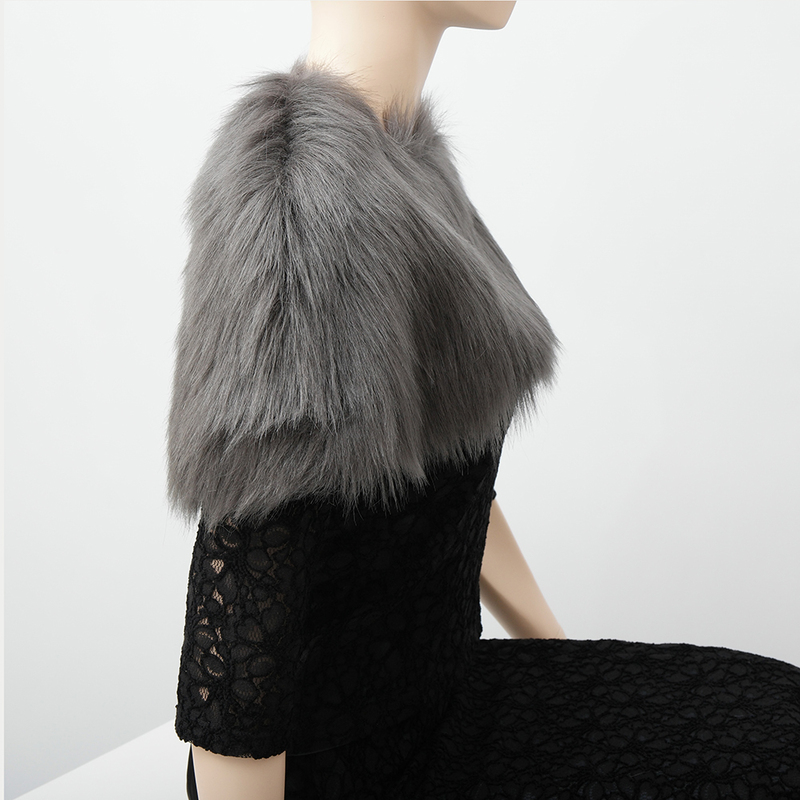 This mini cape Lola looks fabulous with an evening dress, but it won’t be unsuccessful with a roll neck sweater either. Gives you true elegance while keeping your shoulders warm. This design has the advantage that it will stay resting on your shoulders without drooping in any direction when you’re driving a hand-operated chair. XS-Doll wears size 36 here. 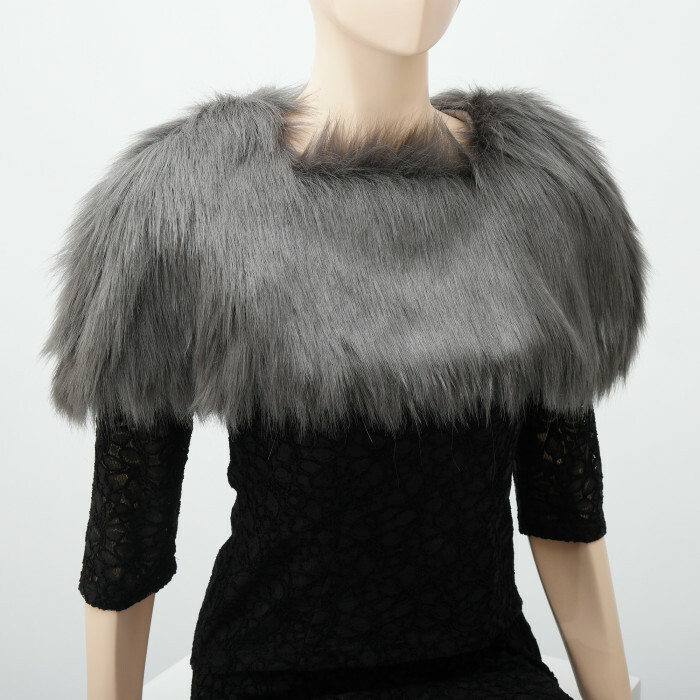 Short mini cape Lola (fake fur) with square neck opening that closes at the front. 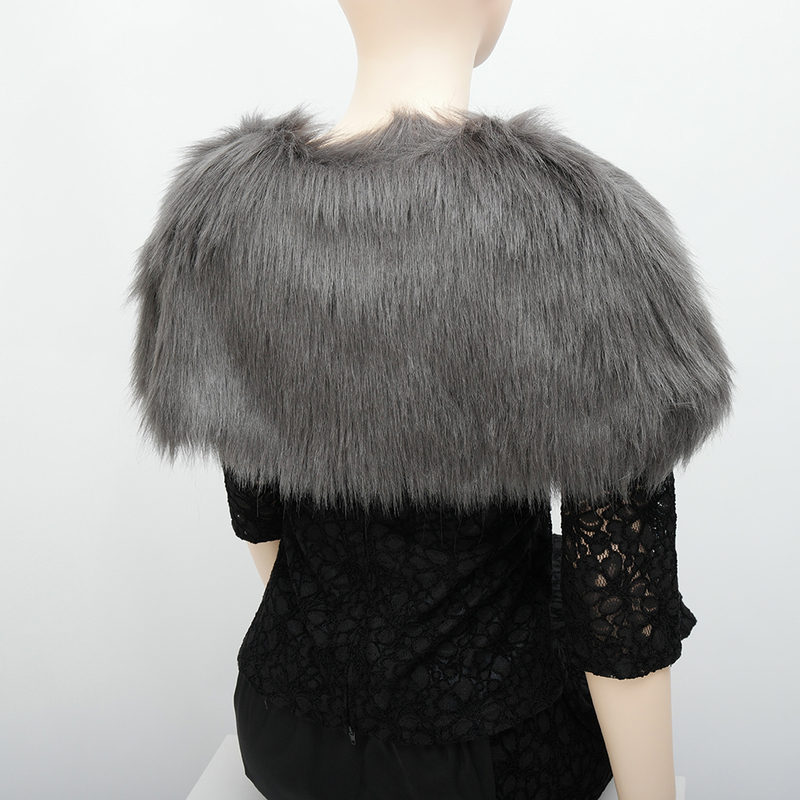 Made from mid grey long-haired fake fur (100% PE). Lined with silver grey satin lining (100% PE). This design has the advantage that it will stay resting on your shoulders without drooping in any direction when you’re driving a hand-operated chair. Cleaning: hand wash only, using mild detergent. This little black dress is sure to become your favourite! It can be worn in lots of ways. Try adding a fake fur mini cape to come across chic, or look truly casual wearing a sweater or denim jacket over it. Our sizes differ from the shopsizes you're used to. [sf_button colour="lightgrey" type="sf-icon-reveal" size="standard" link="http://chairmelotte.com/size_guide_women" target="_blank" icon="fa-long-arrow-right" dropshadow="no" extraclass=""]SIZEGUIDE[/sf_button] XS-Doll wears size 36 here. Select your size below. The perfect alternative to a long skirt, these trousers are truly wide and feature high leg splits. As you move your chair around, the undulating fabric of the legs will seem to rustle and dance in the air. Our sizes differ from the shopsizes you're used to. [sf_button colour="lightgrey" type="sf-icon-reveal" size="standard" link="http://chairmelotte.com/size_guide_women" target="_blank" icon="fa-long-arrow-right" dropshadow="no" extraclass=""]SIZEGUIDE[/sf_button] XS-Doll wears size 38 here. Select your size below. Together with matching trousers Alexandrine or fishtail skirt Isabelle, this top makes a splendid evening outfit. But worn over a pair of jeans, it’s also perfect for a less formal night on the town. Our sizes differ from the shopsizes you're used to. [sf_button colour="lightgrey" type="sf-icon-reveal" size="standard" link="http://chairmelotte.com/size_guide_women" target="_blank" icon="fa-long-arrow-right" dropshadow="no" extraclass=""]SIZEGUIDE[/sf_button] XS-Doll wears size 38 here. Select your size below. Make a festive appearance wearing this shining long skirt with fishtail. It’s narrow at the knees and then flares out lower down, into gorgeous wide pleats around the legs. The centre front zipper is invisible but opens completely, making smart dressing up just that bit more practical. Match with top Isabelle to create a lovely long evening dress. Our sizes differ from the shopsizes you're used to. [sf_button colour="lightgrey" type="sf-icon-reveal" size="standard" link="http://chairmelotte.com/size_guide_women" target="_blank" icon="fa-long-arrow-right" dropshadow="no" extraclass=""]SIZEGUIDE[/sf_button] XS-Doll wears size 34 here. Select your size below.